 Then Jesus turned to the Twelve and asked, "Are you also going to leave?" 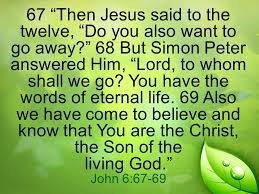 Simon Peter replied, "Lord, to whom would we go? You have the words that give eternal life. We believe, and we know you are the Holy One of God." But despite all the miraculous signs Jesus had done, most of the people still did not believe in him…  But the people couldn’t believe, for as Isaiah also said,  "The Lord has blinded their eyes and hardened their hearts- so that their eyes cannot see, and their hearts cannot understand, and they cannot turn to me and have me heal them." I have come as a light to shine in this dark world, so that all who put their trust in me will no longer remain in the dark. I will not judge those who hear me but don’t obey me, for I have come to save the world and not to judge it. But all who reject me and my message will be judged on the day of judgment by the truth I have spoken.